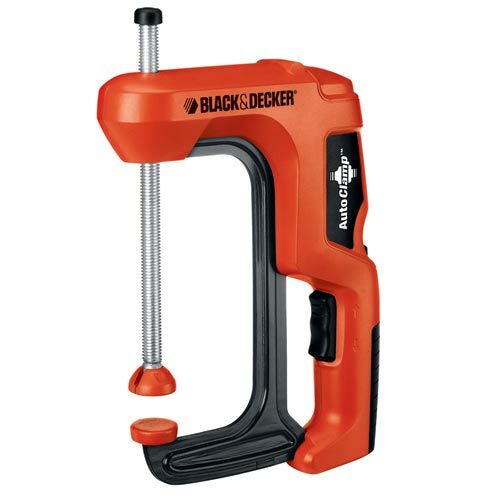 I was walking through Home Depot today, and spotted this interesting new product from Black and Decker. The Auto Clamp is a 6" C clamp with a powered actuator that will allow a user to position and clamp and object with one hand. The battery powered clamp has a handle with a trigger that allows the user to firmly grip and operate the clamp. According to B&D, the clamp offers 300 to 500 pounds clamping force, has a 3" throat depth, and can clamp 60 times with 2 AA batteries. I noticed a small hex wrench attached to the back of the clamp. Apparently it is the manual over ride, which definately would require use of both hands to remove and operate it.